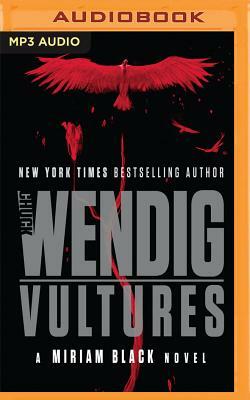 Vultures (Miriam Black #6) (MP3 CD) | Let's Play Books! In the sixth and final thriller of the "wildly entertaining" (Kirkus Reviews) Miriam Black series, Miriam tries to break the curse of her powers, but first she must face The Trespasser a final time. To end the Trespasser's influence in her world, Miriam must face her demon a final time. And, this time, one of them must die. Vultures is a heart-pounding conclusion to the series: "Think Six Feet Under cowritten by Stephen King and Chuck Palahniuk" (SFX).